Kenya-based Aga Khan University Hospital has opened a new Heart and Cancer Centre. 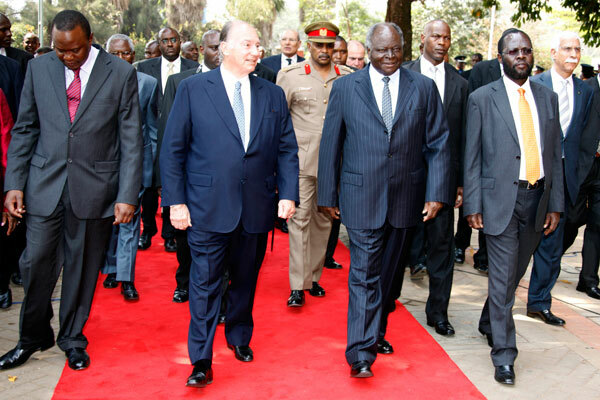 The opening ceremony Monday was presided over by President Mwai Kibaki and His Highness the Aga Khan, the spiritual leader of the Ismaili community. President Kibaki called for concerted efforts in the fight and treatment of cancer, noting that 50 Kenyans died daily as a result of the disease, while 82,000 were diagnosed annually. His Highness the Aga Khan, who is also the Chancellor of the university hospital, said the Aga Khan Development Network (AKDN) will continue to partner with governments, the financial sector and the civil society in meeting the demands and challenges posed by the technological changes in the health sector. The Aga Khan observed that the Heart and Cancer Centre was in response to the burgeoning growth in chronic diseases in Kenya and the region and assured of quality and affordance service. The centre, the Aga Khan said, was equipped with the most advanced technology to provide high standard care and treatment for the full spectrum of heart and cancer diseases. President Kibaki said his government would expedite the Draft Cancer Bill and Strategy in order to provide a framework for the treatment and control of cancer and cardio-vascular diseases. He pointed out that once enacted, the Bill will complement the Tobacco Control Act and the National Alcohol Control Act that were now operational. 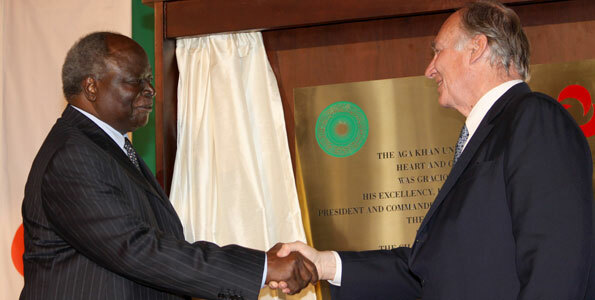 Nairobi, 25 July 2011 - His Excellency President Mwai Kibaki of Kenya inaugurated the Aga Khan University Hospital’s Heart and Cancer Centre today, in the presence of His Highness the Aga Khan, Chairman of the Aga Khan Development Network (AKDN). The US$ 50 million facility brings international standards of patient care and cardiology and oncology treatment to Kenya, positioning the University Hospital as a hub in an integrated AKDN health system in East Africa. It also represents a significant expansion for the Aga Khan University’s Faculty of Health Sciences in the region. “We see our medical programmes here in Nairobi as nodes in a broad, regional health care network, reaching from Arusha to Kampala, from Nyeri to Mtwara and from Kigali to Malindi. Our goal is an integrated, best practice regional health system – providing a continuum of services from preventive and primary care to tertiary hospital-based care,” said the Aga Khan, speaking at the inauguration ceremony. The Centre is part of the Aga Khan University’s long term development plans for its Faculty of Health Sciences, which includes the expansion of the Nairobi University Hospital to a 600-bed tertiary care facility and the establishment of an Undergraduate Medical Education Programme, an Undergraduate Nursing Programme and a School of Allied Health Professionals. Beyond the medical field, the University is planning a new campus in Arusha to house a Faculty of Arts and Sciences, and the expansion of its Institute for Educational Development in Dar-es Salaam. New graduate schools are envisioned in the fields of Management, Leisure and Tourism, Law, Government and Public Policy, and Economic Growth, as well as a new Graduate School of Media and Communications, whose foundation ceremony is expected to take place later this week. An equally ambitious agenda for health-related programmes envisions an integrated regional health system for East Africa. Drawing on best practices, the system will seek to address fast-growing health problems that are emerging due to lifestyle changes in the developing world. According to the World Health Organisation, 70 per cent of new cancers in the next 15 years will occur in developing countries, affecting younger working-age populations. Developing countries will therefore face a growing burden of non-communicable diseases such as cancer, diabetes and heart disease alongside existing infectious diseases. “In Kenya alone, some 80,000 new cancer cases are diagnosed each year, with an unusually high number among young people,” noted the Aga Khan. “The new Centre will be ideally positioned to address such issues,” he said, noting that it would offer specialised training in cardiology and oncology that is not currently available in East Africa. Recognising the high cost of quality health care, the Aga Khan University Hospital also provides a subsidy to patients for whom the cost would otherwise be prohibitive. “The Aga Khan University Hospital, through its Patient Welfare Programme, provides an average subsidy of 50 per cent to those patients who are unable to afford their care,” said the Aga Khan. He went on to point out that creative combinations of “endowment funding, credit and insurance offerings” would be required in the future to address the economics of health care. The Heart and Cancer Centre was established at a cost of over US$ 50 million with support from the Government of France, which provided US$ 35 million of financing through the Agence Française de Développement. “This will be a bracing challenge, involving not only the University and the Hospital but also a wide array of cooperating partners, governments, schools and medical institutions,” said the Aga Khan, naming the University of Alberta and the University of California at San Francisco among the supporting partners. Expressing his gratitude, the Aga Khan said that “without this international support, from France and others, including many individual donors, our solidly founded initiatives for the future would be but slender dreams”. The inauguration ceremony was attended by the Deputy Prime Minister and Minister for Finance, Honourable Uhuru Kenyatta, the Minister for Medical Services, Honourable Professor Peter Anyang’ Nyong’o, the Chief Executive Officer of Agence Française de Développement, Mr. Zerah and various other government dignitaries and the Board of Trustees of the Aga Khan University. President Mwai Kibaki has called for concerted efforts in the fight and treatment cancer, noting that 50 Kenyans die daily as a result of the disease while 82,000 are diagnosed annually. To help fight the disease, the Government will expedite the finalization of the Draft Cancer Bill and Strategy in order to provide a comprehensive framework for the treatment and control of cancer and cardio-vascular diseases, President Kibaki assured Kenyans Monday. The President pointed out that once enacted the Bill will complement the Tobacco Control Act and the National Alcohol Control Act that are now operational. To further enhance access to heart and cancer treatment, especially to rural populations, the Head of State said, the Government will establish cancer centres outside Nairobi. "The Government is also modernizing facilities at the Kenyatta National Hospital to meet current needs," the President said. President Kibaki was speaking at the Aga Khan University Hospital in Nairobi where he presided over the official opening of the hospital's Heart and Cancer Centre. He emphasized that the Government attaches great importance to the development of the health sector, saying the health of Kenyans is crucial to the country's socio-economic development. Said the President: "It is for this reason that the Government has consistently increased funding for the health sector from 15 billion shillings 8 years ago to about 60 billion shillings currently." In this regard, the President welcomed contribution of other players, especially the private sector and development partners, towards complementing the efforts of the Government to meet the increased demand for healthcare services. President Kibaki observed that, as a result of the joint efforts of the Government and the private sector, the country has recorded positive developments with Infant Mortality Rate declining from 77 per 1000 children born to 52 per 1000. The Head of State said the proportion of children receiving full immunization has also increased from 57 percent in to almost 80 percent. 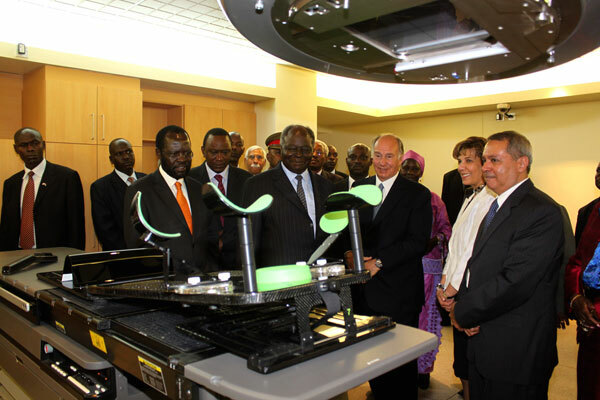 President Kibaki, once again, commended His Highness the Aga Khan for his personal initiatives to improve the lives of Kenyans, saying the opening of the Heart and Cancer Centre is a major milestone towards bringing world class healthcare and medical education to Kenya and the wider East African region. "The Centre, demonstrates the long term commitment of Your Highness to building excellence in the provision of quality healthcare in our region. Indeed, this state-of-the-art facility will provide an opportunity for Kenya to serve the rest of Sub-Saharan Africa," President Kibaki said. Noting that the Heart and Cancer Centre will be accessible to the poor through the Aga Khan University Hospitals' Patient Welfare Program, the President said the program will ensure that world class treatment is available even to those who cannot afford the services. President Kibaki added that the opening of the Heart and Cancer Centre is a timely response to cardiovascular diseases and cancers which are increasingly becoming a big health challenge, saying the centre will not only provide quality care but also create local capacity by training future generations of doctors in the specialties of cardiology and oncology. Said the President: "This Centre will also be used to train professionals and undertake research in these areas. It will enable our professionals and expatriates working outside Kenya to come and offer the much needed services to our people." Speaking during the occasion, Deputy Prime Minister and Minister for Finance Uhuru Kenyatta thanked the government of France through the French Development Agency for the continued support to Kenya 's development agenda. Mr. Kenyatta also expressed appreciation to the Aga Khan Development network for choosing Kenya as its regional center for its activities focusing on health and education sectors. The Deputy Prime Minister said the Government encouraged public/private partnerships in all sectors including Energy, Transport and Agriculture to enable the country realize targets envisioned under Vision 2030. The Minister for Medical Services Prof. Anyang Nyong'o, on his part, assured that the Government was developing mechanisms that will ensure poor Kenyans access specialized treatment. He also paid tribute to the Aga Khan Foundation for supporting Government initiatives in the provision of quality healthcare services. His highness the Aga Khan, who is also the Chancellor of the Aga Khan University, said the Aga Khan Development Network (AKDN) will continue to partner with governments, the financial sector and the civil society in meeting the demands and challenges posed by the technological changes in the health sector. The Aga Khan observed that the newly opened Heart and Cancer Center was in response to the burgeoning growth in chronic diseases in Kenya and the region and assured of quality and affordance service. The center, the Aga Khan said, is equipped with the most advanced technology to provide high standard care and treatment for the full spectrum of heart and cancer diseases. Saying the Aga Khan University was also partnering with other international institutions to build local capacity to provide highly specialized healthcare, His Highness assured the underprivileged members of society that they will access medical services. Others who spoke during the occasion included the Director-General FDA Mr. Dov Zerah and the Aga Khan University Hospital Cardiac Programme Director Dr. Harun otieno. The ceremony was also attended by former Tanzanian President Benjamin Mkapa, Public Health Minister Beth Mugo and Head of Public Service and Secretary to Cabinet Amb. Francis Muthaura among other dignitaries. The Aga Khan University, an agency of the Aga Khan Development Network, operates in eight countries including Kenya , Tanzania , Uganda , Egypt , Pakistan , the United Kingdom , Syria and Afghanistan. Nairobi, 25 July 2011 — Thousands of Ismailis gathered at the Parklands Complex Pavillion in Nairobi to witness the opening of a new Heart and Cancer Centre. The Aga Khan University Hospital facility was inaugurated by His Excellency President Mwai Kibaki of Kenya in the presence of Mawlana Hazar Imam. The Heart and Cancer Centre brings international standards of patient care in cardiology and oncology treatment to Kenya, positioning the University Hospital as a hub in an integrated AKDN health system being established in East Africa. It also represents a significant expansion for the Aga Khan University’s Faculty of Health Sciences in the region. “Today’s inauguration of the Heart and Cancer Centre follows in this long tradition, and points the way to broader, future horizons,” said Hazar Imam. The Centre is part of the Aga Khan University’s long term development agenda for its Faculty of Health Sciences, which includes the expansion of the Nairobi University Hospital to a 600-bed tertiary care facility and the establishment of an Undergraduate Medical Education Programme, an Undergraduate Nursing Programme and a School of Allied Health Professionals. The integrated regional health system for East Africa envisioned by the Imam responds to emerging health trends in the developing world. According to the World Health Organisation, 70 per cent of new cancers in the next 15 years will occur in developing countries, affecting younger working-age populations. Developing countries will therefore face a growing burden of non-communicable diseases such as cancer, diabetes and heart disease alongside existing infectious diseases. “The opening of the Heart and Cancer Centre is, therefore, a timely response to this threat as it will provide quality care and also create local capacity by training future generations of doctors in the specialties of cardiology and oncology,” noted President Kibaki. The President also praised the Aga Khan University Hospitals’ Patient Welfare Programme, which provides an average subsidy of 50 per cent of the cost of care to those for whom it would otherwise be unaffordable. The $50-million Heart and Cancer Centre was established with financial support from the Government of France, as well as the assistance of numerous partner institutions including the University of Alberta and the University of California in San Francisco. “Without this international support, from France and others, including many individual donors, our solidly founded initiatives for the future would be but slender dreams,” said Mawlana Hazar Imam. 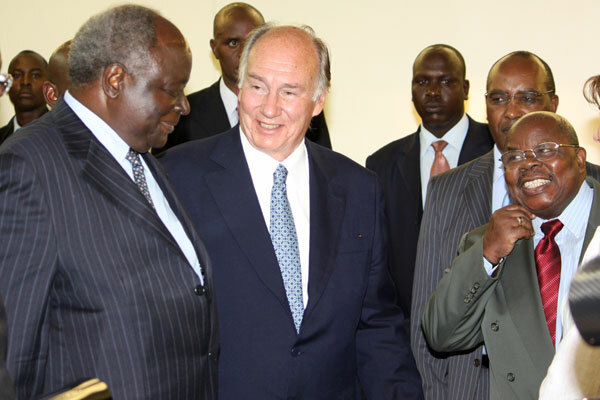 NAIROBI, Kenya, Jul 25 – The Aga Khan has urged governments to tap the benefits of private public partnerships to boost healthcare especially cancer, with statistics of 50 Kenyans dying of the disease every day while 82,000 others are diagnosed with the ailment annually. Speaking during the opening of the Heart and Cancer Centre at Aga Khan University Hospital, Nairobi, on Monday he expressed concern that unlike in the past when cancer was mostly common in older people, the trend was changing as the disease was spreading to younger people. “The World Health Organisation warns us that heart diseases and cancer will reach epidemic proportions in the next decade or two unless we take decisive counter-measures. In Kenya alone some 80,000 new cancer cases are diagnosed each year with an unusually high number among young people,” he asserted. He urged the government to nurture partnerships with the private sector and establish strategies that will help manage cancer and heart diseases to come up with quality as well as affordable medical care services in the country. He further accentuated the need of investing in proper medical training and research which, he noted, many African countries overlooked. The Aga Khan called on developing countries to start venturing in quality research and education to equip medical centres with qualified manpower to address medical needs of their citizens. “Let me mention two investment areas that are most sadly short-changed in the developing world, research and education. Productive research needs to be rooted in patient-based experience, even as sound practice must be informed by new knowledge,” he said. He insisted on African nations empowering local medical institutions to provide high tech training and medical care in view of the high costs involved to get treatment and studies abroad. “Let us put behind us the day when young Africans thought they had to go to other parts of the world for quality medical education. Similarly, let the day also pass when African patients think they must go to other parts of the world to find quality medical care,” he commented. President Mwai Kibaki who launched new state-of-the-art centre shared the same thoughts of concerted efforts in the management of cancer while he appreciated the role played by the private sector in provision of medical services. The President pledged the government’s commitment to respond to the increasing cases of cancer and heart problems as be promised to speed up finalisation of the Draft Cancer Bill and Strategy to facilitate a broad framework for treatment and control of the two ailments. “The Government will also fast track the finalisation of the Draft Cancer Bill and Strategy in order to provide a comprehensive framework for the treatment and control of cancer and cardio-vascular diseases. Once enacted, the Bill will complement the Tobacco Control Act and the National Alcohol Control Act that are now operational,” he promised. President Kibaki further announced the government’s plan to equip Kenyatta National Hospital with modern cancer treatment facilities and also extend the services to other parts of the country to benefit those in rural areas. Medical Services Minister Prof Anyang Nyong’o who felt that cancer was on the increase due to, among other factors changing lifestyles, singled out reforms in the medical sector as a critical intervention that would offer care to those in need especially the poor in the society. As he appreciated the launch of the heart and cancer centre in Nairobi, he said Kiambu and Gatundu districts had been offered for training of medical personnel from the Aga Khan University. Finance Minister Uhuru Kenyatta who hailed the new centre acknowledged the benefits that Kenyans would reap from the centre citing the challenges faced due to shortage of resources in the medical sector in the country. He said the launch of the centre was a positive gesture and an example that the government and the private sector in Kenya should emulate to establish medical centres of excellence to counter the shortage of quality medical care and also bring down the cost of treatment. The Sh4.5 billion centre is designed to respond to the increasing cancer and heart diseases and it is the first of its kind in East Africa. The five-storey complex equipped with among others five theatres and 23 intensive care beds will also be a research and an education centre for training cardiologists and oncologists. Nairobi, Kenya, 25/07/2011 - His Excellency President Mwai Kibaki of Kenya inaugurated the Aga Khan University Hospital’s Heart and Cancer Centre today, in the presence of His Highness the Aga Khan, Chairman of the Aga Khan Development Network (AKDN). The US$ 50 million facility brings international standards of patient care and cardiology and oncology treatment to Kenya, positioning the University Hospital as a hub in an integrated AKDN health system in East Africa. It also represents a significant expansion for the Aga Khan University’s Faculty of Health Sciences in the region. The government is planning to wide the provision of cancer related health services in various health facilities including KCMC and Bugando hospitals in Kilimanjaro and Mwanza regions respectively as an initiative geared to address the growing challenge of deaths resulting from the disease. Speaking in Dar es Salaam yesterday during the launch of the Oncology Programme of the Aga Khan Hospital, Minister for Health and Social Welfare Dr Seif Rashid said the move comes as statistics show that there are about 44,000 new patients diagnosed with cancer in the country. “Currently many people don’t have access to timely diagnostic and curative services due to shortage of skilled health care workers and shortage of health facilities that offer diagnostic and treatment services to cancer patients…we must end this,” he said. Speaking of the Aga Khan new Oncology programme which is part of the hospital’s phase two expansion plan worth 130bn/-, he said the building is designed for cardiac and other medical specialists. He said it is another important achievement in Public Private Partnership (PPP) and a milestone in health improvement in the country. Earlier, Resident Representative of the Aga Khan Development Network, Princess Zahra Aga Khan said Oncology clinics which began in December last year have to date carried out over 50 chemotherapy treatments. “Our Oncology programme will be the most comprehensive compared to other private health centers that offer the same service in Tanzania. The hospital’s expansion is the largest ever carried out by the Aga Khan Health Services since its establishment in 1964 and the single largest private sector investment in health care in Tanzania,” she said. According to her, the new facilities are designed to come up with almost 13,000 square metres, renovations of approximately 6,000 square metres and will double the hospital’s capacity to over 150 beds. She said the development will also provide an opportunity for capacity building and additional recruitment resulting in a total staff complement of over 800 healthcare practitioners and other professionals who will be responsible for providing much needed and high-end clinical services. “We are committed to working with the Government of Uganda to help save the lives of cancer patients in need of treatment while it works to re-establish its radiation therapy capacity,” said AKUH-Nairobi Chief Executive Officer, Shawn Bolouki. The Aga Khan University Hospital in Nairobi (AKUH-Nairobi) announced Tuesday that it will work with the Government of Uganda to provide as many as 400 cancer patients with free treatment in response to the breakdown of Uganda’s only radiotherapy machine. Patient-related logistics are being discussed with the relevant authorities. The treatments will be paid for by Aga Khan University’s (AKU) Patient Welfare Programme, which is funded by the hospital and augmented by individual and corporate donors and provides subsidized medical care to needy patients. The announcement is part of AKU’s commitment to providing high-quality health care to the people of Uganda and to combatting the growth of non-communicable diseases such as cancer in East Africa. In December, His Highness the Aga Khan, Chancellor of AKU, and His Excellency President Yoweri Museveni announced plans to build a new Aga Khan University Hospital in Kampala (AKUH-Kampala). The first phase of construction is expected to be completed in 2020. This is the second time that AKUH-Nairobi has offered such assistance to cancer patients. Last year, it provided free radiation therapy to Kenyan patients, including children, after the breakdown of radiotherapy machines at Kenyatta National Hospital in Nairobi. AKUH-Nairobi’s Heart and Cancer Centre, which was inaugurated in 2011, is the first centre of its kind in East Africa. With two radiotherapy units and six radiation oncologists, it provides a wide range of cancer care that meets international standards. Services offered include early detection and screening programmes, specialised diagnostics, chemotherapy and radiotherapy treatments, as well as palliative and rehabilitation programmes. In 2014 and 2015, the University Hospital also provided free health screening services at 446 camps attended by 136,000 people, 135 of which provided cancer screening. The only hospital in East Africa accredited by the U.S.-based Joint Commission International, AKUH-Nairobi and its 46 medical and diagnostic clinics in Kenya, Uganda and Tanzania are part of the Aga Khan Development Network’s (AKDN) extensive health care system in East Africa, which includes three other hospitals and additional health centres operated by the Aga Khan Health Services. In total, the system recorded more than 1.3 million patient admissions and visits in 2015. By 2030, non-communicable diseases such as cancer, cardiovascular disease, chronic respiratory diseases and diabetes are expected to become the leading cause of death in Africa, and the cancer burden is expected to grow by 85 percent. In 2012, approximately 645,000 new cancer cases and 456,000 cancer deaths occurred in Africa. AKU faculty members are researching ways to combat the rise of non-communicable diseases in East Africa. Construction of AKUH-Nairobi’s Heart and Cancer Centre was supported by US$ 35 million in financing provided through Agence Francaise de Developpement, grants from His Highness the Aga Khan and a donation from the Jimmy Sayani family of Nairobi. A Kenyan hospital is to provide free cancer treatment to 400 patients from Uganda as the neighbouring country's only radiotherapy machine has broken. The Aga Khan University Hospital said it would do all it could to help and encouraged others to do the same. The breakdown of the machine in Uganda has left thousands at risk of missing potential life-saving treatment. Uganda's government has said it will cover the travel and other costs for the 400 going to the Nairobi hospital. The private, not-for-profit hospital in the Kenyan capital has two radiotherapy units and six radiation oncologists. Radiotherapy treatment can be expensive - and most patients in Uganda are unable to afford to pay for the treatment. "We are committed to working with the government of Uganda to help save the lives of cancer patients in need of treatment while it works to re-establish its radiation therapy capacity," Aga Khan University Hospital's CEO Shawn Bolouk said in a statement. "Our values as an institution dictate nothing less. While we can only treat a small fraction of those requiring care, given our resources and the tremendous need that exists, we will do all we can to help, and we encourage others to follow our lead." Details of how to transport the patients were being worked out by the relevant authorities, the hospital statement added. The BBC's Catherine Byaruhanga in Uganda's capital, Kampala, says the Ugandan government has also agreed to pay for the 400 patients' accommodation and food as well as for those of a relative or friend if an attendant is needed. The government says it has purchased a new radiotherapy machine and it should be up and running in six months, once a special bunker has been built to house the radioactive equipment at Mulago Hospital in Kampala. Other treatments are still available in Uganda, but the cancer institute at Mulago Hospital says that three-quarters of the 44,000 new cancer patients in Uganda last year needed radiotherapy. Patients from Rwanda, Burundi and South Sudan are also referred to Mulago Hospital for radiotherapy. The treatment uses radiation to target and kill cancerous cells in a specific part of the body, and can be used for many types of cancer. The incidence of cancer is on the rise in Africa overall as life expectancy increases. The Aga Khan University Hospital in Nairobi (AKUH-Nairobi) announced Tuesday that it will work with the Ugandan government to provide as many as 400 cancer patients with free treatment in response to the breakdown of Uganda's only radiotherapy machine. "We are committed to working with the Government of Uganda to help save the lives of cancer patients in need of treatment while it works to reestablish its radiation therapy capacity," said AKUH-Nairobi Chief Executive Officer Shawn Bolouki. In a statement, Bolouki added, "Our values as an institution dictate nothing less. While we can only treat a small fraction of those requiring care, given our resources and the tremendous need that exists, we will do all we can to help, and we encourage others to follow our lead." The announcement comes just days after Ugandan government said only 400 out of the 17,000 cancer patients, who need radiotherapy care, will be airlifted to Kenya for treatment. State minister for Health, Dr Chris Baryomunsi, told Parliament in April 14 that The Aga Khan Hospital in Nairobi had offered to assist only 400 Ugandans who need radiotherapy care as government procures a bunker for a new machine. The minister, however, said the doctors at the Uganda Cancer Institute will assess the 400 patients to ensure that those who are badly off are the ones who benefit. This explanation, however, provoked a barrage of responses on the floor as members demanded to know whether the minister was condemning others (16,660) to death. According to Bolouki, patient-related logistics are being discussed with the relevant authorities. "The treatments will be paid for by Aga Khan University's (AKU) Patient Welfare Programme, which is funded by the hospital and augmented by individual and corporate donors and provides subsidized medical care to needy patients," Bolouki explained. He said the announcement is part of AKU's commitment to providing high-quality health care to the people of Uganda and to combatting the growth of non-communicable diseases such as cancer in East Africa. In December, His Highness the Aga Khan, Chancellor of AKU, and Ugandan president Yoweri Museveni announced plans to build a new Aga Khan University Hospital in Kampala (AKUH-Kampala). The first phase of construction is expected to be completed in 2020. AKUH-Nairobi's Heart and Cancer Centre, which was inaugurated in 2011, is the first centre of its kind in East Africa. With two radiotherapy units and six radiation oncologists, it provides a wide range of cancer care that meets international standards. Uganda’s only Cobalt 60 radiotherapy machine installed at Mulago hospital broke down in April leaving cancer patients without access to radiotherapy treatment. Aga Khan University Hospital, Nairobi (AKUHN) has signed a Memorandum of Understanding with the Uganda Cancer Institute to provide free radiotherapy treatment for 400 cancer patients. This matter first came up in April when Uganda’s only Cobalt 60 radiotherapy machine installed at Mulago hospital broke down, leaving many patients who need radiotherapy treatment, in despair. The MOU was as a result of discussions between the two institutions to formalize this arrangement that had been announced by the then state minister for health Dr. Chris Baryomunsi. Shawn Bolouki, the Chief Executive Officer of Aga Khan University Hospital said that the radiotherapy treatment will be paid for through the hospitals - Patient Welfare Programme, funded by the hospital and augmented by individual and corporate donors. The programme provides subsidized medical care to needy patients. For 400 cancer patients in Uganda, another chance at living a long life may be just around the corner, following the efforts made by the Aga Khan University Hospital to formalise free radiotherapy treatment for them. Yesterday, the hospital which is based in Nairobi, Kenya signed a Memorandum of Understanding (MoU) with the Ugandan Ministry of Health allowing them to commence the free treatment of cancer patients, while the Ugandan government works on replacing its broken down – and only – radiotherapy machine. The patients will be travelling to the hospital in Kenya in batches of 20 individuals. Every year in Uganda, around 3,000 people need radiotherapy treatment, and this exceeds the ability of the country’s cancer institute to treat them adequately. These patients usually have to rely on the option of travelling overseas to access the level of specialised healthcare that they require, and most cannot afford to. Thus, to support such individuals, the Aga Khan hospital is entering into partnerships such as the present one with the Uganda Cancer Institute (UCI) to help reduce their health and financial burdens. The UCI, which is committed to researching and treating cancer in Uganda, has been plagued with infrastructural challenges that hamper its effectiveness. This includes equipment that are inadequate and obsolete, unavailability of funds, lack of drugs and poor staffing. Therefore, the current partnership with the Aga Khan Development Network will assist in boosting the confidence and capability of the institute. For now, approved cancer patients with tumours and significant chances of surviving their ordeal will be provided with road transportation to Nairobi. The Uganda High Commission will provide the patients with accommodation in Nairobi, along with other forms of support that they would require. In the long run, however, plans are being made to establish the Aga Khan hospital in Kampala, and Ugandan cancer patients would soon be able to access specialised healthcare in their home country. The Aga Khan hospital made their intentions to support the Ugandan Ministry of Health known in April when the only radiotherapy machine in the country malfunctioned. The signing of the MoU took place yesterday in a ceremony at the headquarters of the Ministry of Health in Kampala, and was signed in the presence of representatives of the ministry and the Aga Khan Development Network. The world does not only operate via commercial enterprises and this has been amply proved by the Aga Khan University Hospital Nairobi. Their gesture, offering free radiotherapy treatment to over 400 Ugandan cancer patients, even if it were though an MOU with Uganda’s cancer institute, is very commendable and I would wish to suggest that other companies and organizations follow suit. Not only does this give hope to patients, it also shows that there is a lot of positives in regional cooperation. Thank you Aga Khan Hospital. Kampala — The patients, Mary Birungi and Mary Gahoire, from Mbarara and Hoima districts respectively, were the first in a group of seven that Hospice Africa took to the Aga Khan hospital for treatment. Uganda's only radiotherapy machine broke down in early April, leaving about 2,000 patients stranded. Hospice is a charity that cares for terminally-ill patients. Ms Miriam Donohoe, the charity's communications and advocacy consultant, said the patients that Hospice sends to Kenya are funded under the Road to Care programme, which was initiated by Canadian doctor Joda Kuk in 2011. "He observed the enormous needs of women with cervical cancer in rural settings during a visit to Hospice Africa Uganda," said Ms Donohoe. "After Uganda's only radiotherapy machine collapsed, it was agreed to use the programme to send Hospice patients to Nairobi for treatment," she added. The two patients spent a total of 10 weeks in Nairobi. Coastweek-- The number of heart specialist doctors in Kenya and the region is set to increase and ultimately improve care for patients suffering from heart diseases thanks to a Cardiology Training Fellowship Programme started by Aga Khan University Hospital to train qualified physicians in the specialty. The University Hospital is currently the only one offering a structured curriculum-based programme in cardiology in the region. To be admitted to this highly competitive and intense programme, candidates should possess a Master of Medicine degree or an equivalent Royal College of Physicians degree. The training entails multiple rotations in five core areas of practice including inpatient rotations, outpatient rotations, imaging rotations, cardiac catheterization laboratory and completion of a research project before completion of the programme. “For the first time in Kenya, we are now able to train cardiologists to conduct complex procedures in heart medicine including implantation of heart devices and procedures related to haemodynamics (blood pressure evaluation in heart chambers) monitoring in very sick patients. “Training is hands-on with a dedicated team of consultant cardiologists who are widely involved in research to improve existing care models and innovations in methods of care delivery. “Fellows are trained on how to conduct and interpret different cardiology imaging modalities including echocardiography, cardiac MRI, cardiac CT scan and nuclear imaging to make diagnosis”, says Dr Mzee Ngunga, Director, Cardiology Fellowship Programme and Consultant Interventional Cardiologist at Aga Khan University Hospital. The three year training programme curriculum is tailored for Africa with a bit of borrowing from North America particularly on fellow evaluation and assessment. Currently three fellows are undergoing the programme with a fourth one expected to join in mid 2018. “This is the first recognised fellowship programme in cardiology in the region and its uniqueness stems from the fact that our fellows undergo a structured and curriculum-based programme that models them into a well rounded cardiologist that can deliver care to patients in a dynamic and challenging environment in Africa”, says Dr Mohamed Jeilan, Director, Cardiology Services at the hospital. According to Dr Ngunga, currently with a population of 48 million, Kenya has only about 40 cardiologists, most of whom practice in Nairobi and the other few in Kisumu and Mombasa which unfortunately leaves the rest of the population with long distances to travel to access care. This means every cardiologist attends to 1.2 million Kenyans, a dire deficit the fellowship programme is aiming to address. Cardiovascular disease including heart disease and stroke, is the world’s number one killer. Each year, it’s responsible for 17.5 million deaths and by 2030 this is expected to rise to 23 million. In Africa, the latest projections suggest that by 2030 more people will die from cardiovascular disease than from any other cause of death. The rate of progression in this condition is both remarkable and alarming. The fact that Kenyans in their twenties and thirties are now experiencing heart attacks means we can no longer afford to ignore the growing risk of heart disease and need to have adequate and capable cardiac personnel to handle the challenges ahead. Kenya now joins other few African countries offering the programme like Egypt, South Africa and The Sudan. Cancer patients in the country can breathe a sigh of relief after the installation of a new cancer machine in Aga Khan University Hospital. The hospital has acquired an ultra-modern Positron Emission Tomography (PET) CT scanner and Cyclotron from GE Healthcare. The PET CT machine is a molecular imaging system that gives an accurate indication of the progress of cancer in its earliest stages. With this technology, clinicians can confidently assess a patient’s response to cancer treatment, reducing time spent on unnecessary procedures and cost of treatment. The acquisition of the equipment is part of an ambitious cancer therapy and management project that has been set up at the facility valued at S658.2 million. “Through the acquisition of this specialised system, AKUH has reaffirmed its premier status as the leading provider of quality clinical care, teaching and research in sub-Saharan Africa. No longer will people need to leave the region in order to benefit from its life-saving diagnostic capabilities,” a statement by the hospital sent to newsrooms read. Patients in need of specialised location of cancer in their bodies and determination of the disease stage have in the past been flying out to countries, notably India, for the procedure. According to the World Health Organisation, cancer is now the second leading cause of death globally, with 70 per cent of death occurring in low and middle income countries. AKU chief executive Dr Shawn Bolouki said about 70 per cent of patients do not respond to their initial chemotherapy. This means only 3 in every 10 patients will get favourable outcomes from their initial chemotherapy sessions. Dr Bolouki said AKU is committed to health professional education. “We are committed to providing quality education to all cadres of the medical profession, from students in medicine, nursing and other health science professions and to the continuing education of health professionals in practice, supporting the building of health expertise in the region,” he said. The equipment will be officially launched by First Lady Margaret Kenyatta on Friday. For many Kenyans, the mention of cancer still carries a shroud of fear and uncertainty. For a varying set of reasons, the prevailing culture among the population is that of engaging healthcare on a reactive than proactive basis. This means that the detection and consequent management begins when the cancer is at an advanced stage, which often causes more suffering than relief to patients. The awareness of early signs and symptoms for most cancerous cases is essential in order to facilitate diagnosis and treatment at an early stage. A positive diagnosis for cancer need not be synonymous with a death sentence. Sadly, majority of the deaths due to cancer in Kenya are because of ignorance about risk factors for the illness, the importance of a healthy lifestyle, preventative care and the absence of a steady continuum of care around oncology. There are approximately 4,465 new breast cancer cases and 1,969 deaths annually; and approximately 4,800 new cervical cancer cases - and sadly over 50 per cent deaths annually. The increasing cancer burden in Kenya has prompted the government to outline significant intended investments in cancer care and treatment in the country. According to the National Cancer Control Strategy 2017- 2022, basic cancer treatment facilities will be available in 47 counties. This includes the proposed establishment of four comprehensive regional cancer treatment centres in Mombasa, Nakuru, Nyeri and Kisii for Sh8 billion in a five-year period. With an understanding of the challenges in the country’s oncology treatment system, a collaborative approach involving a diverse range of stakeholders in the public, private, non-profit and academia sectors is required and is the most effective approach to solving the challenges at hand. Adoption of relevant technologies in cancer care has also seen many countries make great strides in fighting the disease. Recently, Aga Khan University Hospital unveiled the first advanced early detection PET CT and Cyclotron in Sub-Saharan Africa. The technology provided by General Electric Healthcare gives an accurate indication of the progress of the disease at its earliest stages. This means Kenyans will no longer need to travel abroad for accurate cancer diagnosis, a shift that should significantly lessen the burden of healthcare costs. The need for new and disruptive models to address the growing oncology burden in Kenya calls for an integrated primary healthcare approach that includes the development of human resources for health and incorporating tailored task shifting to close clinical capacity gaps. In conjunction with Aga Khan University Hospital, GE Healthcare hosted a PET CT and Cyclotron symposium to drive dialogue on latest innovations and interventions in early cancer diagnosis and detection. Other symposia will be held to continually bridge the knowledge gap in the field.